The currency of Tunisia is Tunisian Dinar. The life expectancy in Tunisia is around 75 years. 98 precent of the population are Muslims. The highest point in Tunisia is Jebel ech Chambi with its 1544 meters. The official language of Tunisia is Arabic, but French is also widely spoken there. 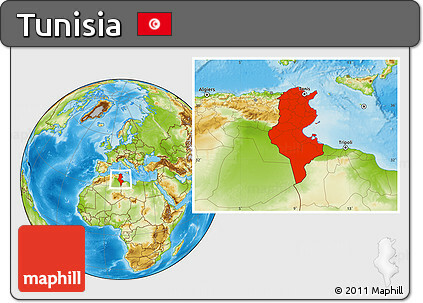 More than a quarter of Tunisias population live in the capital Tunis. The word Tunisia is derived from Tunis; a city and capital of modern-day Tunisia. The Tunisian oasis at Kebili has been found to be containing evidence of Stone Age settlements. The city Kairouan is the fourth most important city in the Islamic world after Mecca, Medina and Jerusalem. The city Hammamet is Tunisia’s largest tourist resort and has been attracting holidaymakers from all over Europe since the 1960s. Capital City: Tunis is the sprawling capital of Tunisia, a country in north Africa. It sits along Lake Tunis, just inland from the Mediterranean Sea’s Gulf of Tunis. It’s home to a centuries-old medina and the Bardo, an archaeology museum where celebrated Roman mosaics are displayed in a 15th-century palace complex. The parklike ruins of ancient Carthage sit in the city’s northern suburbs. Religion: The population is 99 percent Sunni Muslim. Groups that together constitute the remaining 1 percent of the population include Shia Muslims, Baha’is, Jews, and Christians. Christianity is the second largest religion and about 88 percent of Christians are Roman Catholic.